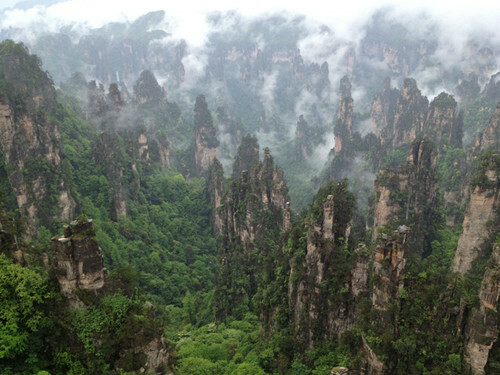 Tianzi Mountain,Tianzishan natural reserve is situated between Zhangjiajie National Forest Park and Suoxi Valley natural reserve and covers an area of 93 sq km. The highest peak is 1,260 meters (4,130ft) above sea level and provides stunning views of the surrounding mountains and valleys. Waterfalls, bridges, stone forests and caves are found throughout the mountains.Tianzishan is known for 4 natural spectacles – the clouds of mist that circle the peaks of the mountain, the amazing views of the rising sun, the moonlit nights and snowcapped winter peaks.They include more than 80 natural platforms to take in the magnificent scenery. Take a tourist bus to Tianzi Mountain Parking Lot. Zhangjiajie Central Bus Station to Tianzi mountain Ticket Office. Then take the tourist bus to The top of Tianzi Mountain.